Low is a slowcore band which was formed in Duluth, Minnesota in 1993, by Alan Sparhawk (guitar and vocals), Mimi Parker (drums and vocals) and original bassist John Nichols (bass guitar). Zak Sally replaced Nichols after Low's first album and tour. In 2005, Sally quit the band; Matt Livingston replaced him shortly thereafter. In 2008 Steve Garrington took over on bass creating the current lineup of Sparhawk, Parker and Garrington. Their music is commonly described as "slowcore," a subgenre characterised by slow tempos and minimalist arrangements. They are one of the earlier bands to adopt and popularize the style, making them considerable contributors to the slowcore movement. (It is worth noting that the band dislikes this label. In an interview Alan Sparhawk says of descriptions of their music: "What's the cheesiest? Slow-core. I hate that word. The most appropriate is anything that uses the word minimal in it, but I don't think anybody's made one up for that") Parker and Sparhawk's striking vocal harmonies represent perhaps the group's most distinctive element. The band formed in the spring of 1993. Sparhawk had been playing in the Duluth, Minnesota, band Zen Identity. That band needed a new bassist, and Nichols was recruited. At that time, Nichols was a senior at Superior Senior High School in nearby Superior, Wisconsin, and bassist in the band Lorenzo's Tractor. Sparhawk was called upon to teach Zen Identity songs to Nichols. During practices, the two started improvising with some very modest, quiet themes. As a joke, they wondered what would happen if they played such quiet music in front of Duluth crowds, which at that point focused around the loud, grunge, "post-punk" sound. Soon, the joke became a serious thought. Sparhawk disbanded Zen Identity, and he and Nichols recruited Sparhawk's wife Mimi Parker to play a very modest drum kit composed of a single cymbal and a single floor tom. She used brushes almost exclusively. Low's debut album, I Could Live in Hope, was released on Virgin Records' Vernon Yard imprint in 1994. It featured Nichols on bass, though he was replaced by Sally, who joined for the recording of the band's next album Long Division. Long Division and its similar follow-up, 1996's The Curtain Hits the Cast, established the band as critical darlings; extensive touring helped them to develop a highly devoted fan base. "Over the Ocean," a single drawn from The Curtain Hits the Cast, also became something of a hit on college radio. 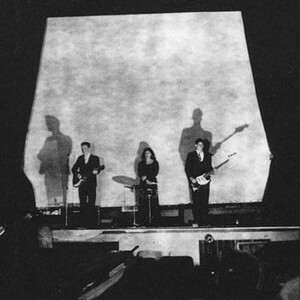 Low experienced considerable difficulties during their tenure with Vernon Yard, and by the time of their next full-length (1999's Secret Name) they had moved to the influential independent label Kranky. In between, they released several singles and EPs. In 1999, Low joined forces with Dirty Three to record an In The Fishtank session for Konkurrent records. All Music Guide called the six-song disc "some of the best material either unit has produced." Of particular note is the disc's lengthy cover of Neil Young's "Down by the River." 2001 saw the release of Things We Lost in the Fire. The following year saw the release of the band's final full-length on Kranky, Trust. All three of the band's full-length releases on Kranky featured superstar producers: Secret Name and Things We Lost in the Fire feature the work of "recordist" Steve Albini (best known for producing abrasive noise rock and punk groups), who proved surprisingly sympathetic to capturing the band's strengths; while Trust was recorded with Duluth engineer Eric Swanson and mixed by Tchad Blake. In April 2003, Peter S. Scholtes of the Twin Cities weekly paper City Pages posted in his weblog that Sally had left Low. The following month, the band posted an update to the news on their website: "We have all had to work through some personal things recently ... After sorting it out, the good news is that Zak is remaining in the band ..." In July 2003, they toured Europe with Radiohead, Sally in tow. Following a successful tour in early 2004 that vividly demonstrated the band's commitment to their fans (Parker was visibly pregnant throughout), the band signaled their intent to continue making music by signing with powerhouse indie label Sub Pop. To fulfill their contract with Kranky, Low released a three-disc rarities compilation on that label in 2004. Beginning with Secret Name, the band have diversified their sound. The band use subtle electronic music touches to augment their sound, reflective of their tenure with Kranky and their exposure to the Midwest's post-rock scene. Adding a more overt rock element to their aesthetic, the band has used fuzz bass from Things We Lost on the Fire onward, and began using distorted lead guitar on Trust. The band's latest album, The Great Destroyer, nods even further in the direction of rock. Recorded with producer Dave Fridmann and released by Sub Pop in January 2005, The Great Destroyer has received mostly positive reviews; the Village Voice described the record's "comparatively thunderous verve." One notable exception to the critical applause is Pitchfork Media, which rated the album 5.5 out of 10 and panned its lead single "California." Low cancelled the second leg of their extensive tour in support of The Great Destroyer in late spring of 2005. Sparhawk's informal statement, published on the band's web forum and addressed directly to fans, detailed the personal reasons behind the cancellation. In August 2005, however, Sparhawk announced his return to performance, embarking on a United States tour with fellow slowcore pioneer, former Red House Painters frontman Mark Kozelek. However, in October 2005, Sally announced his resignation. Replacing him is Matt Livingston, a longtime bassist and saxophonist in Duluth's musical scene. Low are known for their impressive live performances. Rock club audiences typically watch the band while seated on the floor (due to the difficulty of standing for long periods while listening to such slow and quiet music). During their early career, the band often faced unsympathetic and inattentive audiences in bars and clubs, to which they responded by bucking rock protocol and turning their volume down. Their shows often feature drastically reinterpreted cover versions of famous songs by the likes of Joy Division and The Smiths, in addition to their own original material. Live, Low shows a sense of humor not necessarily found on their recordings; a tour in early 2004 featured a cover of Outkast's hit song "Hey Ya." At a gig in Los Angeles on Halloween 1998, the band took the stage as a Misfits tribute act, complete with corpse paint and black clothing. The band's mainstream exposure has been limited: their best-known song is arguably a hymnal version of "The Little Drummer Boy," which was featured in a Gap television ad that depicted a snowball fight in slow-motion to match the song's glacial tempo. A remix of their "Halflight" was featured in the Mothman Prophecies motion picture. However, because of their minimal overhead expenses (the band makes very little use of professional recording facilities), Low have managed to develop a reasonably comfortable career. Low are hardly a Christian rock group, however, at least in the usual sense: neither Sally's religious affiliation (or lack thereof) nor Parker and Sparhawk's faith is mentioned in their latest press kit. Low have often toured with other "Christian, not Christian rock" acts such as Pedro the Lion and the danielson famile. However, there are occasional lyrical references (usually subtle and/or indirect) to Parker and Sparhawk's religion. Sometimes these references are traditional Christian themes. The song "If You Were Born Today," on both the live album One More Reason to Forget and on the Christmas album, quietly suggests what might happen if Jesus were born in contemporary times. On Things We Lost in the Fire, the song "Whore" includes Parker's haunting chorus "you will get your reward", while Sparhawk asks "is it so wrong to think there's more?" Disc one of A Lifetime of Temporary Relief includes the song "David & Jude," while disc two includes two versions of "Joan of Arc" and the Spacemen 3 cover "Lord, Can You Hear Me?" Many references draw specifically on themes from the Church of Jesus Christ of Latter-day Saints. These include "Weight of Water" and "Missouri" on Secret Name, whose title itself refers to an LDS naming ritual; this album also contains the song "Lion/Lamb." The Trust track "The Lamb," at least partially concerns the death of Joseph Smith. The Christmas album's religious content is generally more direct, including in addition to "If you were born today" an original song about the Three Wise Men's subversion of Herod to protect Jesus ("Long way around the sea"), as well as traditionals ("Silent night," "Little drummer boy," the Elvis song "Blue Christmas") and original secular, seasonal songs ("Just Like Christmas," "Taking down the tree," "One special gift,"). Other lyrics have referred elsewhere. Secret Name includes the song "Missouri," which may refer to the LDS community's travels westward. Songs for a Dead Pilot's last track is "Hey Chicago," which says "Hey Chicago, I'm leaving." On Trust, the song "Canada," says "you can't take that stuff to Canada," which inescapably suggests advice to people attempting to take drugs across the border from the U.S. to Canada. (As Minnesota sits along the border of Ontario and Manitoba, this can also be seen as a reference to Minnesota.) Songs on The Great Destroyer frequently reference geography. "California," says "Though it breaks your heart / We had to sell the farm / Back to California where it's warm." This possibly refers to Sparhawk's own mother selling the family farm upon which Sparhawk had grown up (compare the lyrics for "Mom says" on The Curtain Hits the Cast: "mom says / a farm's the best place to call home / but I don't know.") "Broadway (so many people)" refers very specifically to the intersection of Broadway and East 4th Street in New York City: "Last night just north of Houston / Broadway so many people / Through your third story window / I see my favorite record store [most likely Other Music on 4th, a noted independent record store]. At a February 2004 show at "Dante's" in Portland, Ore., Sparhawk told the crowd that the song "Walk into the Sea" was about "a guy who used to live here that we got know pretty well. He's gone now..." in what many fans believe was a reference to Academy Award-nominated singer-songwriter Elliott Smith, a long-time Portland resident. Smith had died just months earlier in October 2003. On the Murderer EP is the song, "From Your Place on Sunset," which refers to many locations in the Los Angeles area. Low owns a record label, Chairkickers' Union, which releases material by other musicians such as Rivulets and Haley Bonar, as well as some of their own material. Sparhawk is notably active in Duluth's small but vibrant independent music scene; he operates a recording studio in the town, in a deconsecrated church that naturally provides the lush reverb characteristic of Low's sound. The Chairkickers label offers another outlet for Duluth musicians, as most groups on the label are from that city, or at least from Minnesota and surrounding areas.